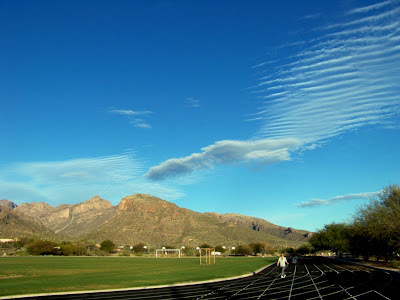 Looking toward Sabino Canyon from the track at Esperero Canyon Middle School on Monday, February 16, 2009 at 6:00PM. Happy skywatching! Visit SkyWatch Friday to see other sky photos from around the world. I am not sure what those kinds of clouds are called but I have a couple on my post. Nice photography. I love the variation in shades of blue in the sky. Great shot. I like the way you shot the clouds. Way cool! I think I also have a shot of those 'ridges', they were too pretty to pass by. I love your long view with the Catalinas in the background. That is a stunning image; the light is nearly too bright for my winter-bound eyes. Love the green and blue contrasts. Good capture and fantastic blue sky for sky watch. Wow, it looks like a postcard! Whoa! Check out that sky! Fantastic shot & perfect for Sky Watch Friday!!! What a unique sky, I love how you incorporated it with great colors on the ground, well done. Such interesting clouds. I really miss the mountains of Arizona - thanks for posting this. Looks like a tractor has been plowing the sky fields! Beautiful! Oh Diane, You live in a gorgeous area of the country.. I love the desert--and cactus. It's just like another world to a Tennessee gal like me. Your sky picture is incredible. I also enjoyed looking at your squirrels and your cactus pictures.. I'm glad I found your blog. Thanks for visiting mine. The sky is really quite beautiful and I like the lines of the clouds to the side. This must be one of the most beautiful walking tracks to be on. Wow, what diverse cloud patterns. Great capture. Love Sabino Canyon view. Cool clouds formation. Nicely captured. Gorgeous shot. I love the way the clouds fan out right hand side and also love the mountains. wow, they were artistic clouds! So pretty! Love those clouds. Fabulous photo. I love how you have composed the track in the foreground, your cloud formation is wonderful, such a brilliant blue sky and gorgeous scenery. All comes together to make a first class photo. Thanks for visiting my blog and leaving your comments. Happy SWF and have a great weekend. Great photo, Diane.. LOVE that blue sky!!!! Hope you have had a great day. What an awesome shot, Diane! And I love the clouds in this photo! Beautiful photo!! I love those clouds! !